You went to the store, you made an awesome meal, you package it up for the week, and by the weekend you've thrown out half of it and are feeling discouraged. That pretty picture on your Instagram with all its likes and shares is feeling phony as you think about the cookies you ate in the break room instead while it sat in the fridge abandoned. I am not the type of person who gets bored eating the same thing over and over so a large batch of one thing works well for me all week. What I've learned though is that I'm lucky. Many clients have come to me asking for more recipes or saying that they are struggling to make themselves eat what they made by day 3. We're all busy though and most of us don't have time to make a brand new meal every single day. I've talked before about how to keep it simple. So how do you get a little creative to find that variety you need without making life difficult? The first thing you have to let yourself do is to stop freaking out about recipes. Most people have multiple cookbooks that they never even open. Trying new recipes is great. Falling off your plan because you don't have a brand new one is not. 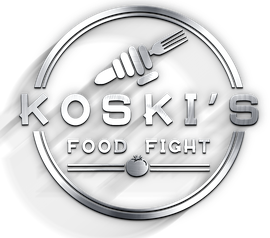 I think it is important to keep learning different perspectives so in 2016, I went to one of the first CrossFit Culinary Ninja courses with Nick Massie (AKA Paleo Nick) in San Diego, CA . 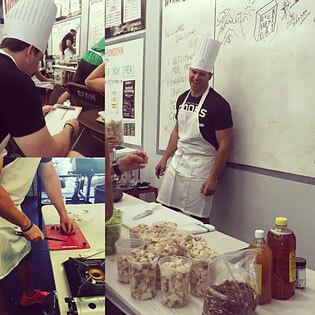 One of the interesting things taking a course run by a professional chef was that even though there was definitely a recipe, there was no pressure to be exact. The pressure was to be efficient. Understand the task. Get the work done. You don't have all day. I'm not saying you have to rush your kitchen like a crazy person but think about how much time you waste double checking, re-measuring, and worrying about being perfect. Your recipe isn't going to be trash if you have a pinch more than a tablespoon, half a carrot too little, or throw in a little extra of something you have on hand. Take a quick second to understand what you are trying to accomplish, make a plan, and execute. Give yourself permission to be imperfect. Give yourself permission to be creative. Do you have a recipe you like? Think about little ways it could be a little bit different. Are there ways you can divide a batch into different variations? Now that you're ready to go, let's look at an example. 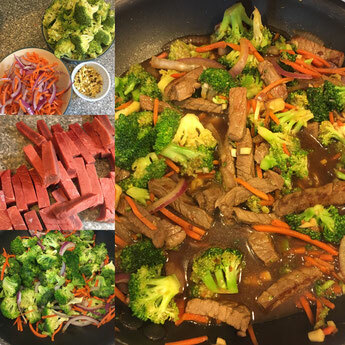 I'm a big fan of stir-fry because it is quick and easy. 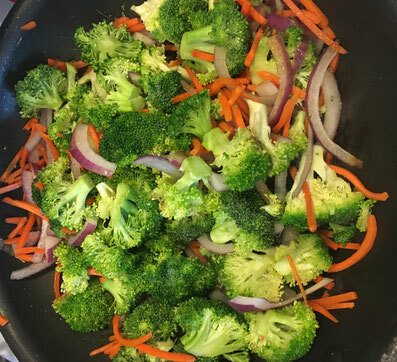 You can use the same base of veggies (shown: broccoli, carrot, and red onion) and still get variety in one single food prep session. Portion your stir-fry over different bases such as brown rice, quinoa, udon, soba, etc. Mix in some mango in some of the chicken or shrimp versions. Top some with toasted sesame seeds. Now you have multiple meals from one effort that aren't all the same. Vary what you pack them with each day (apples & peanut butter, salads, carrots & hummus, maybe a little serving of dark chocolate) and stick to your schedule. You aren't hungry. You aren't bored. You're moving toward your goals. That break room cookie might not seem so tempting after all. Recipes aren't a bad thing. They just shouldn't be a crutch that keep you from getting what you need out of each prep session: food you are going to eat. Try a stir-fry. Don't have a starting place? Here you go...let me know how you make it your own. the twofold checking, re-measuring, and agonizing over being great. Your formula won't be junk in the event that you have a squeeze more than a tablespoon, a large portion of a carrot too little, or toss in some additional of something you have close by. Take a brisk second to comprehend what you are attempting to achieve, make an arrangement, and execute. Give yourself authorization to be blemished. Give yourself consent to be imaginative.